As I wrote last week, I recently finished my legendary, Kudzu. I am glad I did it. I love my pretty flowerbow. I have some bones to pick with some of what it takes to create a legendary weapon. Namely, the precursors. Part of what you need to craft a legendary – and this is the part I really didn’t mention in my previous post – is a weapon that gets forged along with the various gifts you’ve crafted. It is a weapon that, unless you buy yours early on in the crafting process, you are going to keep in your hands for however long it takes to run from the trading post to the bank to the mystic forge. And it is, by far, the worst part of making a legendary. I hated getting the mystic clovers. I hated slogging through World vs. World for badges of honor. But more than anything else…I was not happy at all with that damned precursor. As of right now, there are three ways of getting a precursor. The first is to hope you get supremely lucky and one drops for you – they can be gotten out of meta-event chests, dungeon chests, and drops from champions. The second is to throw weapons into the mystic forge and hope for the best. The third is to save up money, on top of all you’ve already spent, to purchase one on the trading post. How much money are we talking about? Well, let’s take a look. Pardon my language…but what the hell. Those prices are disgusting. And there is zero reason why they should be that high. Someone crafting a legendary is already going to be pouring hundreds of gold into their weapon – why is it necessary to throw up to another 700g at it? With the most recent patch, the chests for meta-events were updated to guarantee at least one rare or better as a reward, and could be gotten once a day per character (this is going to be updated to where the rare or better reward is account-bound, not character bound, with the March update). One side effect of this is the staff Final Rest, which had never before been actually seen in game (personally I do not believe it was actually in the game until this update), has become common enough that it currently sits around 12 gold. Ecto dropped in price from close to 40s down to around 27-28s (it’s now back up to about 30s). One would think that, with the introduction of of more rares and exotics into the system, precursors would become slightly more common, and prices would go down on them. That, however, has very much proven to not be the case. Prices on precursors have instead mostly gone up in the meantime. Some of them have spikes to ridiculously high prices. Look at the Lover, for example – nearly 700 gold! How on earth is that even remotely reasonable? It was 400 gold two months ago. Sure, it did get an update, and prices spiked after that. But they dropped quickly…and then started climbing again to what it is now. AJ pointed out that prices going up may be because people have more money due to the update to the meta-event chests, which is causing them to put in higher buy orders, so people are putting the sell listings higher than they otherwise would. This may well be true. However, since theoretically the number of precursors available on the market should also have increased with this change, that should have evened out, and it hasn’t. This is one of those things where I really wonder how it was released in this way. ArenaNet has said that they want to include a scavenger hunt for obtaining precursors; this shows that they know that this is an issue. They did an infusion of the market with them with the Lost Shores chest. However, the scavenger hunt was also said to be something they weren’t actively working on. There’s been no other noticeable increase other than Lost Shores. Optimus said the other day that he would like to see another Lost Shores-type chest at the end of Flame and Frost. I both agree with this and disagree. I agree because there’s no two ways about it, they really do need to get more precursors out into availability. It’s not right that someone should have to, after spending all of the time and effort and money that a legendary costs, be stuck then waiting while they save up another several hundred gold to get that one last piece. However, at the same time, I disagree, because unless it’s something that happens regularly, it will be a repeat of what happened after Lost Shores; there were so many precursors suddenly flooding the market that people were selling them for next to nothing, believing that they were going to remain not impossible to obtain, and then the prices promptly shot back up after a couple of weeks had passed. Many people – myself included – wound up being burned hard by this. The other option, which I would prefer, is to simply increase the drop rate on the precursors. Take that .001% chance of them dropping (or whatever it is), and turn it into a .01% chance. Or something similar. They’d still be rare – very much so. But they wouldn’t be so rare that if you get one, you’ve got the kind of luck where you need to be off in Vegas making yourself rich in real life. I am very curious to see what sort of shape the scavenger hunt is going to take. I hope that it becomes a thing in that not too distant future – I want to make Bifrost, after all. But I know what I don’t want to do is buy another precursor. Yes, I have completed my Legendary, that I wrote about wanting to get not too long ago. I made Kudzu, the longbow, for my Ranger, and along the way learned a lot of things! Not just things about how to make money quickly in-game, but also more about my playstyle on various professions, and also things to do when you just need to take a break from the work. First of all, it did not take nearly as long as I had expected. I started working on it back in mid-January, and as I had written in my previous post, my goal had been to finish by August 25th. It is now March 12th – it took me just under two months to complete. Having done this once, I think I’d be able to do it again…which is good, as Bifrost has caught my attention again. Most importantly, I’ve learned a few important things about how to go about getting a legendary in an efficient manner. My first tip is to pick a legendary that you like. If you’re going to be spending this much time and money on a weapon, pick one that you like the look of – even if it means that you’re getting one for an alt instead of your main! My main is a Mesmer. I am not fond of the legendary greatswords, Bolt and the Minstrel do not suit her at all, I don’t really use scepter or torch at all, and Quip is…well, Quip (I actually do not think it’s as ugly as most people do – I think it’s a hilarious weapon. 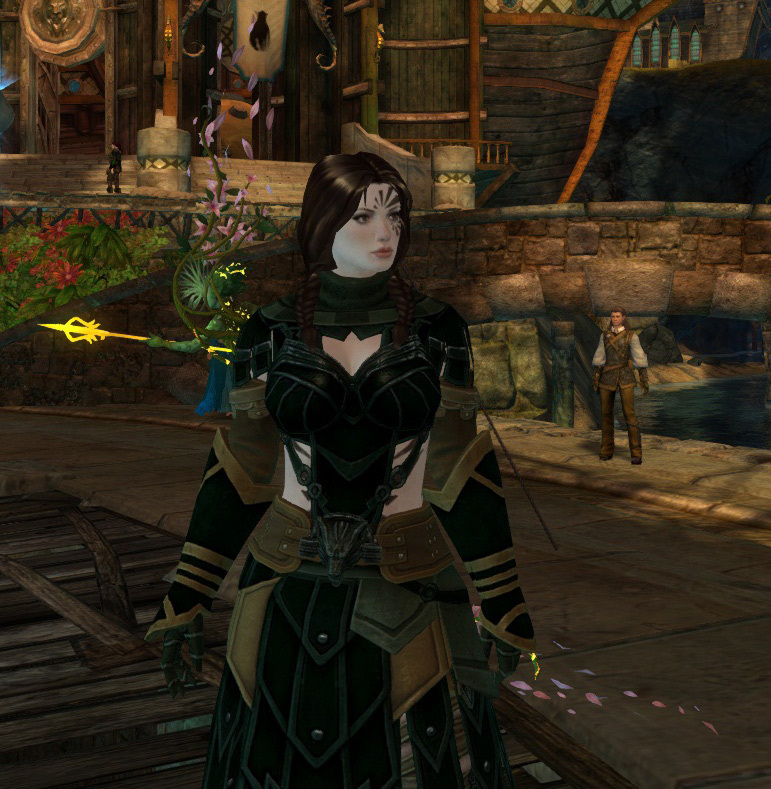 However, again, it does not suit my Mesmer at al). Bifrost I love, but I had started that one before and stopped for reasons I’ve written about already. 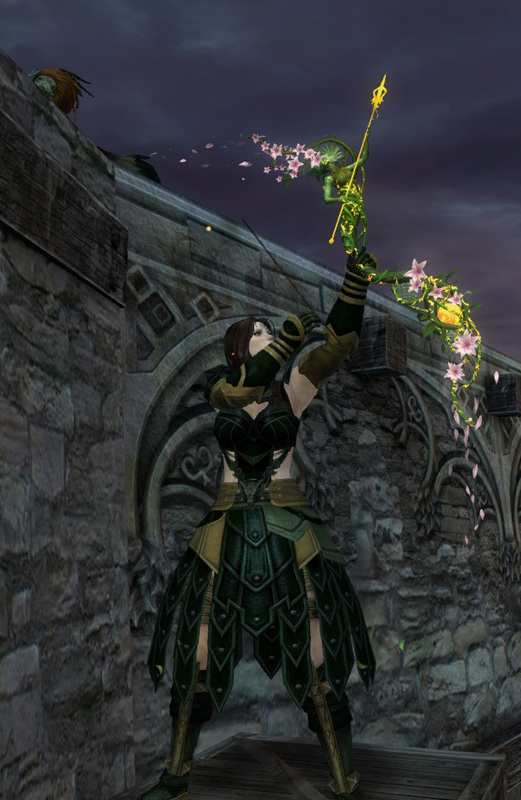 That, and I don’t use staff too frequently on my Mesmer anymore. Kudzu has always been my favorite of the legendaries, so it’s no surprise that’s the one I chose to make, even though it required leveling my Ranger. On the flip side, if you do decide to make yours for an alt, make sure it’s a profession you enjoy playing! Luckily I fell in love with my Ranger once she hit around level 50. Just like you shouldn’t make a legendary you hate, don’t make one for a character or profession you dislike. Yes, that’s my pet on the wall behind me…no, I don’t know how it got up there. Second, finish map completion ASAP. You need 100% map completion to craft a legendary, so you may as well get it done early. You get a good amount of money from completing all of the hearts, not to mention the zone rewards. In higher level zones you will receive exotic armors, which can be sold for gold (or if you get particularly unlucky like I did and get ones worth 40s, salvaged for ecto). You are also going to need all of those skillpoints for the bloodstone shard and for getting your mystic clovers. Learn to at least tolerate World vs. World early on. 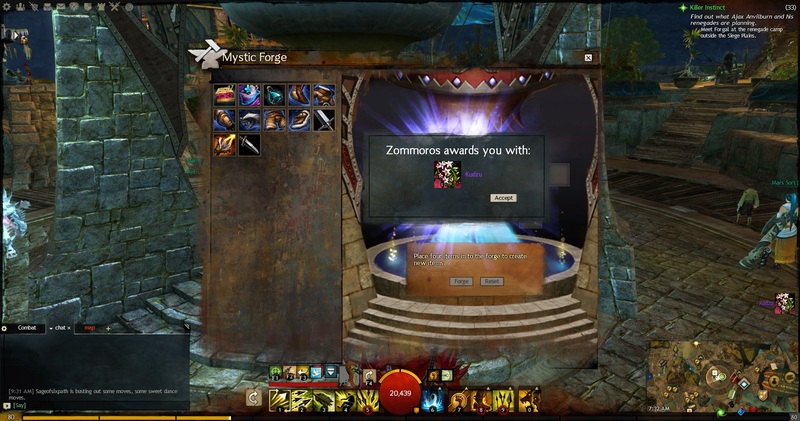 I am not a fan of WvW. I have not had good experiences there. But completing that 100% is part of map completion…as well as those pesky badges of honor you need. There are multiple ways you can go about getting those. Some people have good luck with getting them from fighting and taking on groups. I personally have never had any luck with that…and I don’t enjoy it anyway. Where did my badges come from? The jumping puzzles. There is one in each borderlands, as well as the one in Eternal Battlegrounds. Completing them brings you to a chest that gives you a number of badges depending on your level – at level 80 I was generally getting 4-5 from the borderlands puzzles (as low as 3, as much as 6), and between 13 and 18 from the EB chest. The borderlands puzzles are very easy to do; the EB puzzles is much trickier, being probably one of the hardest jump puzzles in the game. However, the way it is set up means that a fall doesn’t generally mean you have to restart. And if there are friendly Mesmers around, even better – a well-placed portal can skip you past the vast majority of the puzzle! Just be careful, though, because while my experiences are that most people consider the jump puzzles neutral territory (I have definitely done a borderlands puzzle run alongside someone from Sea of Sorrows and another from Sanctum of Rall with all of us just letting the others go on our own way), there’ll be the occasional fight that breaks out. My advice: if you see someone from another server, make a friendly emote at them (/wave or /bow). If they don’t reciprocate, it may be better to back off until you have some allies with you. If they do, then it’s generally safe to proceed. Chuck it all into the Forge…and get a shiny! Work on mystic clovers first. These are, no lie, one of the most frustrating parts of the process. I’m not a fan of the Mystic Forge – I think it’s a cheap cop-out way of doing things. And I’m not fond of how so much of this game is RNG based. Clovers are, at least, one of the kinder RNG gambles in the game – if you don’t get the clover(s), most of the time you get tier 6 mats in return. This isn’t guaranteed, of course – there are also mystic coins, ecto, lodestones, crystals, obsidian shards, and bags of treasure in the loot table for what can come from a failed clover attempt – but most of the time, if you don’t get a clover, you’ll get some number of t6 mats out of it, and having a decent chunk of mats already helps greatly when it comes to getting those stacks completed. Connected to that, use the 10 clover recipe as much as possible. Yes, throwing 10 ecto at a time into the mystic toilet can be a painful experience. However, the rewards are much greater – 10 clovers, or up to 40 mats. Once I started seriously working on my clovers, I got far better results out of the 10 recipe. Still, it’s all probability, so everyone’s results will vary. Save, save, save! You need a lot for a legendary. Full stacks of each tier 6 fine crafting material, tons of karma, 100 gold for icy runestones, on average two stacks of ecto…and that’s just the common ingredients. As tempting as it may be to sell these things for quick cash, don’t – not unless you’ve got all you need! At that point, of course, sell away. Mix things up a bit. Don’t just farm the same things over and over and over – not only will you get bored, but you’ll hit diminishing returns quickly. Find a few things you enjoy doing that are bringing in money, and rotate between them. For a while I did lots of CoF. Then fractals, then Orr, now the meta-events, while swinging back towards Orr with regular dungeons mixed in…it will be a grind. There’s really no other way to put it. But sometimes it’s best to sacrifice a small amount of efficiency to keep things fun. Don’t be afraid to take a break or splurge a bit. Saving up all that money is hard. But don’t feel like it can’t ever be touched for anything ever and you can’t ever treat yourself. 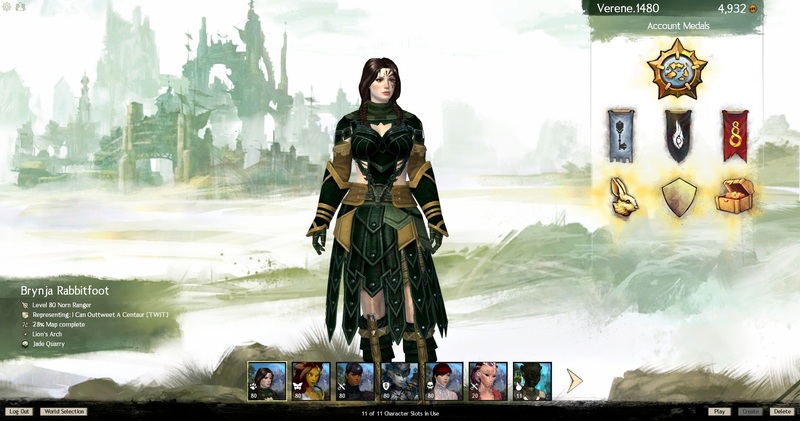 I bought my thief the human t3 top not long ago, because I’ve been wanting it for her since before launch, and why not? Last week I spent about 15g on my necromancer, buying armor skins and unlocking dyes once she got to level 80. Did it set me back a bit? Sure…by like three days. But it was worth it, because not only did I get two characters looking awesome, but like anything, treating yourself occasionally is a good thing. Last, and completely optional, work on it with friends if possible. Myself and my two [TWIT] co-leaders have been doing our legendaries together. I probably would have given up on mine long ago if I didn’t have both of them working on it alongside me. Not because we’ve been helping each other out (which we have been – I wouldn’t have finished today if they hadn’t helped! ), but because if you get frustrated at something, you have someone else that’s doing the same things you are, and understands why you’re frustrated, and can sympathize. It’s not monetary support that’s most important here – it’s the moral support. Also, it’s really helpful when you’re manically running dungeons to get those tokens. Now, this isn’t really a guide or anything, and knowing me I’m sure that there’s something I’ve forgotten. Rather, it’s just a collection of tips based on what I’ve learned in crafting Kudzu, things that I can make use of to be better prepared for when I do start actually working on Bifrost (that one will be a truly long-term goal as, having completed one legendary, I’d prefer to just take my sweet time on a second). The most important advice of all is to set goals, but to not worry too much if you don’t meet them, and don’t work so hard on it that you begin to hate it. If you stop collecting for a while, the stuff you’ve gotten will still be there. Good luck – trust me, it’ll be worth it in the end! Since people have asked about the precursor: I purchased mine on the trading post. Any gold weapons I got as drops I salvaged, any exotics I sold, and I simply saved up the 360 gold that Leaf of Kudzu cost. They can drop from meta-event chests, and since those guarantee a rare or better now, they are more than worth doing, but the best thing to do is just save money and hope for the best.